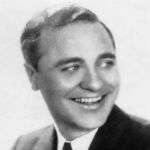 Wayne King (February 16, 1901 – July 16, 1985) was an American musician, songwriter, singer and orchestra leader with a long association with both NBC and CBS. He was sometimes referred to as The Waltz King because much of his most popular music involved waltzes; “The Waltz You Saved For Me” was his standard set closing song in live performance and on numerous radio broadcasts at the height of his career. After playing saxophone for the Paul Whiteman Orchestra, he created “Wayne King and Orchestra” in 1927. King’s innovations included converting Carrie Jacobs-Bond’s “I Love You Truly” from its original 2/4 time over to 3/4. From 1939 to 1941 the Wayne King Orchestra was featured on a national radio program sponsored by Lady Esther. The orchestra disbanded during World War II, and King joined the army, advancing to the rank of major. The orchestra was reestablished in 1946. In 1948, the half-hour Wayne King Show was syndicated on radio via transcription discs. King’s orchestra had a television show in Chicago from 1949 to 1952.